Tie chains add a sophisticated finish to your look and keep your tie in place. Simply hook the clasp over a button and bring your tie through the chain. Perfect for a Father’s Day gift or as a gift for groomsmen. Each tie chain in our selection is in stock and ready for delivery. What is a Tie Chain? The tie chain is a stylish way to keep your unruly ties from flapping in the wind or falling over in the sink as you wash your hands. Don’t laugh… it happens. Tie chains add a professional finish by securing your necktie against the front of your dress shirt. Our tie chains make popular gifts for anniversaries, holidays, birthdays and Father's Day. Each piece is constructed in 2 parts. The upper part of the tie chain is fixed and hooked to a button on your shirt. Your tie is pulled through the chain’s loop and hides the button. The result is a visible chain in front of your tie that remains in place at all times… even when you wash up. Place the over-button closure on top of the chosen button and bring it down to secure. Once in place, begin putting your tie through the open chain. 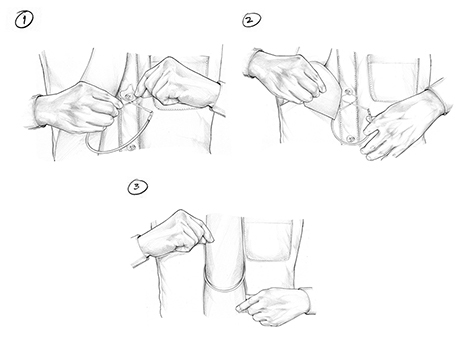 Adjust the necktie so that the chain and tie fall flat and are centred. Tie chains are great for guys that don’t think tie bars, tie clips and tie tacks are for them. Tie bars look great, it’s true… but it’s often difficult to get the bar completely straight. Tie tacks literally put holes through your most expensive ties. Tie chains give the security of a well-placed tie without unnecessary holes or constant checking that your look is askew. Decide if it fits the occasion. Tie chains have the tendency to catch on objects in passing because the chain hangs loosely. It may be best reserved for those days when you want to dress up and stand out. Choose a tie chain that matches your outfit. We offer silver and gold-colored tie chains. Remember to select yours based on the color of your other metal accessories. Wearing silver-tone cufflinks? Go for a silver-tone tie chain. Tie chains are traditionally worn lower on the tie, but this can change according to personal taste and style.